Turf Projects presents an exhibition by the Club Soda Pop Artists at Morden Hall Park’s Stable Yard Gallery. 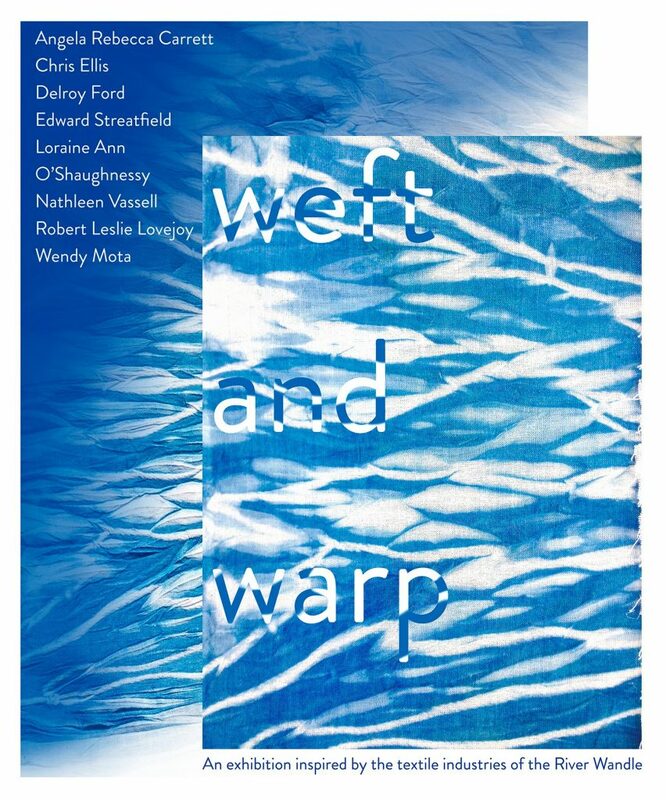 ‘Weft and Warp’ is a collaborative work inspired by the historical textiles industries that existed along the River Wandle, which were at their height in the 18th and 19th centuries. The river provided power for the mills used in the production of calico, natural dyes and fabric printing. Some of the most celebrated textiles printers and manufacturers working along the Wandle were William Kilburn, William Morris and Arthur Liberty. The Club Soda Pop Artists have hand dyed calico with indigo, using the traditional Japanese technique of Arashi Shibori, which creates a pattern that resembles moving water. This has then been embellished with embroidery and printing using industrial objects. With thanks to Wandle Industrial Museum, Morden Hall Park, Croydon Council, Arts Council England and our volunteers, Jacinta Bridge, Mattina Hiwaizi, Jasmine Popper and Meg Southwood. You can get a tram from outside East Croydon station. Get a tram going towards Wimbledon. Get off at the stop Phipps Bridge, which is at the gates to the park. Nearest stop is Morden (Northern Line), then 500 yards walk along Aberconway Road. ‘A Glimpse of What’s to Come’, is the name of a new composition by Club Soda musicians. A response to a commission by Drake Music in association with Southbank Centre. Club Soda’s composition has been inspired by the brutalist architectural style of the Queen Elizabeth Hall on London’s Southbank. The musicians have been influenced by some of the early concerts that were staged at the venue, notably that of Pink Floyd in 1967, David Bowie in 1969 and some of the early Radiophonic workshops that took place there. After spending time researching the archives and exploring the The Southbank, the musicians have recorded a special piece of music on the site itself. No postproduction was used on the recording in order to capture the pure atmosphere and the acoustics of the site, the reflections and the reverbs of the spaces. ‘A Glimpse of What’s to Come’, will be performed live at a special event taking place at the ICA on the 17th March, along with three other commissions by disabled musicians. It will be an evening of audio visual delight, performances, films, improvisation and installations featuring up and coming artists from across London. The ICA is an accessible venue.